WELL, we all arrived home knackered, emotionally drained, hungover and gutted by the result – but the better team won on the day so there can be no complaints. They did to us what we did to them. Twice. They were sprint starters and subdued Boro were sluggish and were punished for it then never had the nous, energy or penetration to claw it back. Norwich played well when it mattered and good luck to them next year. We were numb and dismayed on the whistle and had the heart-ache of trudging away empty-handed from Wembley for a fifth time – but once we pick ourselves up, dust ourselves down and regain some sense of sober perspective it is clear there are still plenty of positives to take from the campaign as a whole. And as we sift through the debris of Wembley there are a lot of reasons to be optimistic for the future. FOR a fifth time dejected Boro supporters had to trudge away from Wembley to the soundtrack of their opponents’ celebrations. That heart-ache doesn’t get any easier to bear with practice. If anything it gets worse. WEMBLEY: an iconic venue that has been central to the dreams of generations of Boro supporters. School yard yearning were left unfulfilled by near-misses, freezes and failures through a barren century. Then, when the finals suddenly came thick and fast, we have been left powerless and impotent as those dreams turned into nightmares. Tony Dorigo’s free-kick killer that spoiled our debut in 1990 (although you never forget your first time). Emile Heskey’s stoppage time sickener after stroppy striker Ravanelli had briefly ignited emotions with our only goal at the Twin Towers; A cruel 43 second Roberto Di Matteo stunner that killed off our first ever FA Cup appearance before it had even begun and hammered in the final nail of a traumatic season. And Chelsea again just 12 months later in the League Cup. “SHUT your gob Vickers. I’ll have a beer if I want to,” was just one of the responses to my column in the Gazette today calling for fans to be ready to play their role and create an awesome roar in our potentially epoch-shaping showdown at Wembley. 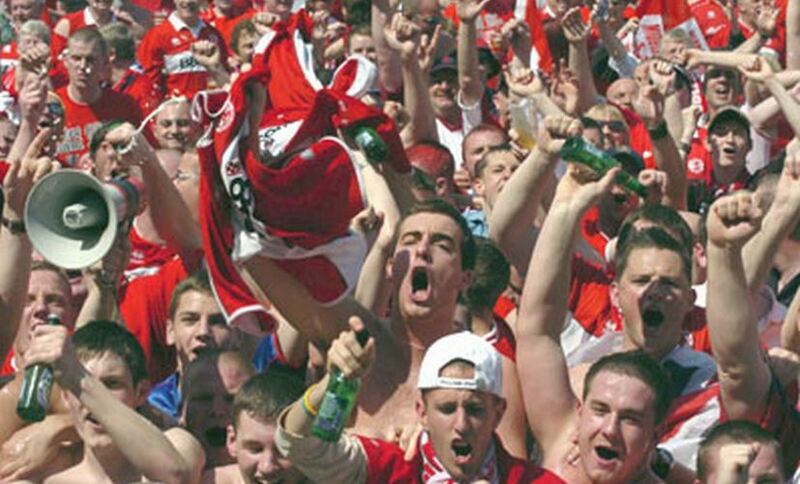 I had committed the heresy of suggesting that at Eindhoven a lot of Boro fans drunk themselves into oblivion and were in no fit state to “sing your heart for the lads.” On that day Boro were out-flanked and out-sung by the passionate and spectacular Sevilla crowd. They took control of the high-ground and were building a wall of noise while thousands of thirsty Teessiders were still necking ale in the Boro square. Walking up to the ground two hours before kick-off there were bedraggled Teessiders crashed out on grass verges looking like the tattered retreating remnants of a defeated medieval army. Meanwhile a sea of Sevilla fans were greeting their team coach like conquering heroes. mobbing it and chanting and pointing at the window. They were buzzing. It felt like they had come determined to seize their destiny. It felt like they had a massive psychological advantage long before kick off. 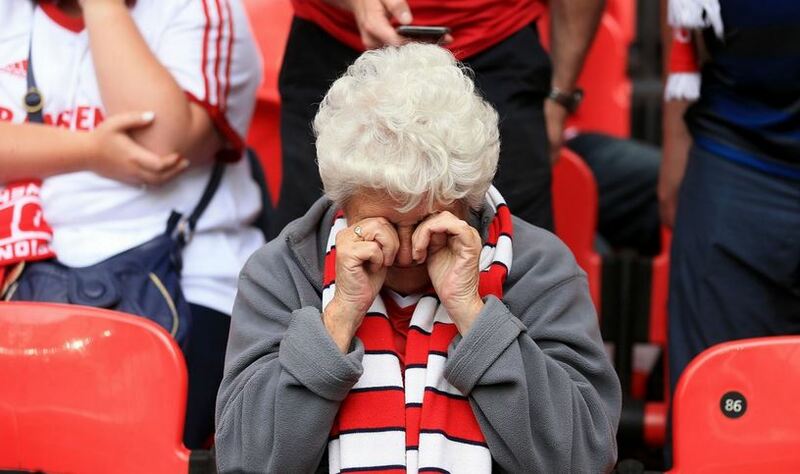 We can’t let that happen again at Wembley. We need to be more focused, more determined, more united and noisier. We need the Red Army to be more like they were at Cardiff- and against Brentford – than they were at Eindhoven. Of course, have a beer. Or two. Three even. Enjoy the occasion. Be in good spirits – but don’t get smashed and miss the intensity of the moment. Play your part. Boro supporters this season have been brilliant and the players and manager have queued up to say how much they have aided the team at important moments in close fought crucial matches. Wembley needs to be the best display of the season from the Red Army. What do you think? Fair comment? Or am I a ‘killjoy doyle’? WEMBLEY-bound Boro’s semi-sonic boom blasted second best Brentford to bits as Aitor Karanka’s historic March To The Arch continued. Red hot iron, white hot steel: the atmosphere was molten and magnificent and Teesside was totally united in pursuit of the promotion prize. A club united like that is hard to beat. Everyone was on their game. Every single person in the ground from battle-scarred diehard to wide-eyed youngsters was energised and totally engaged in an emotionally intoxicating evening, a memorable “I was there” moment , the best night since Steaua. BORO’S new shirt is red. With a Liverpool/Forest/Aberdeen retro eighties echo pinstripe and polka dot lace effect collar and trim … but let’s put the fashionista design considerations to one side for a moment. I don’t mind it. Even if you instinctively think there is something missing, that it feels alien and there should be an eye-catching white flourish somewhere, we’ll soon get used to it, most diehard supporters will by it irrespective of design, manufacturer or price. And some clearly love it already and queued to buy it so they could be the first on their block. And what ever your opinion and it’ll look much better with Premier League badges on. SIX yellow cards in a red hot frenzied, urgent atmosphere under lights and with a passionate partisan support roaring their heroes on: this was cup football at its best. The high-stakes semi-final shoot-out at Griffin Park was electrifying, pulsating and absorbing. The error-strewn affair may not have been “one for the purists” but it was a fantastic spectacle with two evenly matched sides going for it hammer-and-tongs. Battling Boro were brilliant. It was an away leg tactical masterclass of soaking up pressure and hitting on the break. THERE’S a phoney war going on with selected statistical snapshots being used to prop up positions that are more based on faith than fact. And I’m not talking about the election. No matter how much you point to the data, the numbers, there is very little science about how individuals will perceive them . Those double-edged things – ‘facts’ – are all very well if they reinforce your own prejudice but can be easily dismissed by the entrenched opposing camp if they prove too awkward to square. They can be routinely countered with predictably scripted sound-bites and mantras. That’s just like the on-going well rehearsed debates among football fans and the time-honoured tension between the opposite poles of perspective. SO, Brentford: Boro ended up with what may well turn out to be the most favourable of play-off opponents – but despite some strange dynamics and off field orchestration in the closing stages of the Brighton game, that is more by accident than design. A frustrating, flat final fixture saw Aitor Karanka’s team dawdle lethargically and slouch back into fourth place and as a result they are now pitted against the Championship’s real surprise package this term. After the mounting chuntering about the lacklustre limp over the finishing line on a day when an explosive leap from the play-off launch pad was the pre-match minimum demand, being paired with the Bees was generally well received. In fact, in the nuanced post-mortem it almost felt like Boro had been rewarded for their failure to beat Brighton. The camp was happy. It felt as if it that was desired outcome. A lack-lustre and laboured leap from the play-offs launch pad fell flat. It may have turned out to be a dead rubber but Boro will need to bounce back quickly. They will need to add real teeth and tempo to beat Brentford. It was an opportunity to put in an up-lifting, entertaining display and record an emphatic win in front of a rammed Riverside to get Teesside buzzing and go onto the two-legged shoot-out on a high and with momentum. But Boro barely got out of second gear.